It is 5 am in the morning. I will shortly start hearing the footsteps of the monks and their students. The preparations for the morning pray start at 5.30 am. The prayer room, which is decorated with hundreds of lanterns, needs to be heated up. The temple where I am lodging in is located in the temple town of Koyasan sitting at the altitude of 800 metres surrounded by the eight peaks of Mount Koya. Joki-in Temple is among 117 Buddhist temples of Koyasan. 52 of these temples, which all belong to Shingon school of Buddhism – originally born in China and introduced to Japan by Kobo Daishi 1200 years ago – open their door to overnight visitors. I arrive at Joki-in Temple at noon on a very cold winter day. The temperature shows -5 C degree, there is no one around and I am having hard time locating the door leading to the guest rooms. The sudden sound of gong presumably coming from the prayer room makes me feel like I am in a spooky environment similar to the place where the Name of the Rose – a famous novel by Umberto Eco – takes place; a remote and isolated monastery located up in the mountains and filled with mysteries. While I initially feel a little uneasy, it does not take long for my mood to drastically change. The doors opening to the greeting room of the temple lead me into a much more welcoming environment. The lady monk and resident Buddhism students who help me out during my entire stay to better understand the rituals and the daily life in the temple assure me that I can participate in the morning prayers. In retrospect, I now feel a little ashamed of my behaviour at the time, which gives some sort of recognition to the worldwide perception of the Muslim culture – but once the lady monk tells me that I can participate in the morning prayers, I feel compelled to make an additional disclosure to declare that I am coming from a muslim country. I am of course once again assured that I can participate in the morning prayers. I think I already know the answer when raising this silly question but in todays world where belief related tolerance is almost inexistent – I am somehow looking for a verbal confirmation by a monk that no religion is different than another when it comes to inclusion. I clearly want to hear it out-loud. I am also being told that I will be taking my dinners in my room whereas the breakfast will be served in a common area. The dinner time at the temple is particularly important to get an insight into Koyasan buddhist culture. Shojin ryori (Buddhist cuisine) entirely excludes meat and fish and is based on five flavors and five colors. The preparation of the meal is also regarded as a religious ritual and the crucial point is to ensure a certain level of harmony between the seasons and the food consumed. In addition to fish and meat, ingredients such as garlic and onions are also excluded due to their heavy smell and the discomfort that they trigger in human body. The next morning, a student resident of Joki-in Temple who attends the nearby Koyasan University where she studies buddhism notices that I am greatly taken by the kind attitude towards the guests and feeds me with additional information. She notes that the tradition to host guests at Koyasan temples goes back to 1200 years ago – to an era during which the temples open their doors to pilgrims without making any distinction between ordinary people and reverends. We enter the prayer room and the morning pray starts at exactly 5.50 am under the direction of the head monk. In addition to myself, there are two other guests today but I am the only non-Japanese in the room. Everyone is welcome to participate in the morning prayers regardless of the nationality and more importantly of the religious beliefs. This is also the case for the nearby Okunoin Cemetery – the literal meaning of which is “inner sanctuary” in Japanese. This welcoming nature of Okunoin does not only apply to day visitors wanting to take a walk around more 200,000 tombstones located in the cemetery; people of ever nationality and religious belief is welcomed in Okunoin also for eternal residencies. Koyasan was established in 815 by Kobo Daeshi who became the founder of Shingon Esoteric Buddhism in Japan following his training years in China where he was first exposed to Shingon teachings. Kobo Daeshi, who is also referred to as Kukai, is also seen as a founding father in Japan. He was not only an important religious figure but also a leading teacher in the fields of education, art, language and literature. It may however be more accurate to say that “he still is” as it is believed that Kobo Daeshi has not died. He is believed to be in eternal meditation since 835 and still providing guidance to the ones who seek help. Meals are being served to him twice daily by the monks – first one at 6.30 am and the last one at 10.30 am. This rigid daily regimen is something I also make note of at Joki-in Temple where some students substantially limit their daily intake of food just like Kobo Daeshi. I am told that such strict diet is not a requirement but a matter of preference in order to better focus on meditation. Koyasan is an integral part of Sacred Sites and Pilgrimage Routes located in Kii Mountain Range – a region which was added to the list of Unesco World Cultural Heritage Sites in 2004. It is the part of the region including Yoshino and Omine, Kumano Sanzan and Koyasan, which are all connected not only to each other but also to the ancient capitals of Japan, Nara and Kyoto via pilgrimage routes. The region is also particularly important as it reflects a great harmony and fusion between the native religion of Japan – Shinto and Buddhism acquired from China and Korea. This harmony between the different religions is among the primary the reasons leading to the inclusion of the region in UNESCO World Heritage list. UNESCO describes the region as a cultural landscape – meaning “cultural values created jointly by humans and nature” and I somehow get the chills whenever I come across this definition. Then comes Kumano Kodo, which is the name given to the web of pilgrimage routes spread out in the entire Kii Peninsula. My journey in Kii Peninsual goes back to four days earlier before I arrive at Joki-in in Koyasan and starts at the western leg of Kumano Kodo, the pilgrimage route with a known history of at least 1000 years. I want to at least partially experience the routes walked by pilgrims back in the day under substantially more severe conditions before deserving my stay in Koyasan. I decide on a walk of three days covering part of the route known as Nakahechi. I leave Kyoto, which is to this day still the most special city in Japan for me, early on a weekday morning by train to travel down to Tanabe – a small city located at the western end of Wakayama prefecture of Japan. After a lunch break and a short bus ride later, I arrive at Tajikiri – the starting point of the pilgrimage route. Once we leave Tanabe beyond, the scenery starts to change very quickly. We are no loner accompanied by the uninspiring city/town architecture of Japan but by the beautiful rivers and forests instead. In Takijiri I am greeted by Kennis Wong – an area resident of 20 years. She will accompany me during the first two days of my walk. While the main route goes from Tajikiri located at the Western end of Wakayama to the east cost town of Shingu, there are also many other alternative routes that you can take. The first day of the walk involves a relatively short but a steep hike – also known as the second most challenging section of Kumano Kodo. It takes me a few minutes to understand and appreciate the difficulty raking of this section, which requires a non-stop climbing for at least an hour before reaching the gentler hills. Kennis notes that the people who walked the pilgrimage route in the old days only wore sandals and the route was not as well kept. The walk was so dangerous that the pilgrims wore white clothes for the walk. The chances of dying were very high and they wanted to greet death wearing white clothes signifying purity. Once I hear the story, I feel a little bit ashamed of my own comfortable clothes and particularly of my hiking boots. I try not to mention any word reminding the notion of tiredness again. We are in February and Kennis and I are the only ones walking the route. The busy season for this route starts in late March and lasts till the beginning June – a month which is described as the fifth season in Japan, the rainy season! Thousands of cedar trees accompany us along the route. It is impossible to not notice certain regions in the forest where the trees are lined in perfect order. I quickly learn that the group of trees standing in perfect order is actually matter of heated debate in Japan, which has been going for almost decades. One of the governmental policies to revitalize the countries economy following the devastating effects the World War II had on the country was to cut down native trees and replace those with trees which grow quicker and have a higher commercial value. 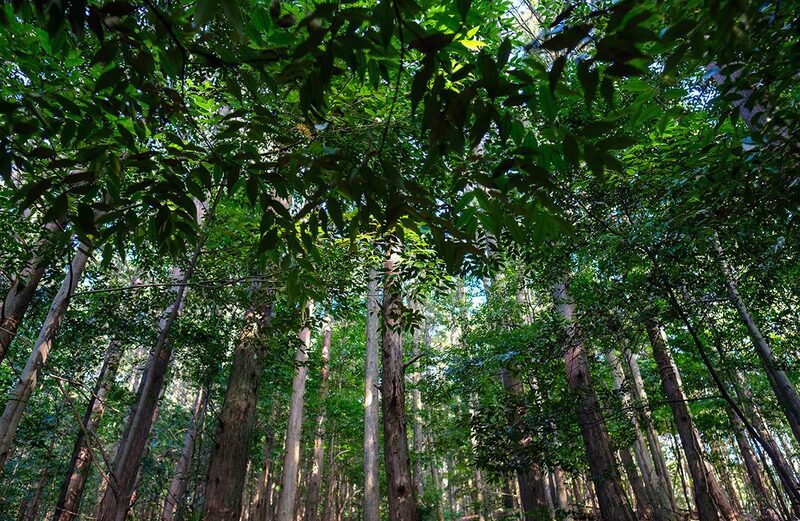 This creates an environment in Japanese forests where one can easily spot the difference between parts occupied by native trees and the planted ones. This is not only the case for Kumano Kodo but also for many other forested areas of Japan that I had a chance to visit. In Lost Japan: Last Glimpse at Beautiful Japan, commonly accepted to be one of the best books written by a foreigner about Japan, Alex Kerr criticizes the forestry policies of Japan and notes that the replacement of the native trees with the commercially more viable new trees turned the forests of Japan into a desert where it is no longer possible to walk by hearing the sounds of plants and animals. I however turn out to be a little luckier than that. We hear a sound while checking out the trees smashed down to the ground as a result of the typhoon which hit the region in September 2011. When I turn my head, I notice three beautiful deers looking at us. Kennis notes that I am very lucky as the animals are usually only spotted during very early hours of the day. Our walk on the first day, which takes around four hours takes us to Takahara, also known as Kiri-na-Sato – “a village covered by fog”. Kennis leaves me here to get back to Tanabe where she lives with her husband who runs a restaurant. It will take her only ten minutes to cover the distance that took us four hours to walk today through the forest by car. It is only me and two Japanese people who are in town for business at my lodge. Once I settle into my room. I take a quick dip at the Japanese style hot bath – “onsen”. I wake up early the next morning and soon find out that there could be no better nickname for this small town. The fog which walks through the mountains during the blue hour is hypnotizing. The view reminds me of the hilltop town of Nagarkot in Nepal but also the scenes from the movie Clouds of Sils Maria – a visual feast. On the second day of the walk, we take off at Takahara with the end goal of Tsugizakura-oji where I will be spending the night at a Japanese style guesthouse. The trail that we cover today entails a much longer than the distance we covered on the first day but involves a gentler climb. We pass by numerous “oji” s just like on our first day. Oji means the secondary shrines located on the road to protect the walkers. We pass through forests and demi-frozen lake until the lunch time. We are again the only ones on the route today. When I am quite confident that we will not run into another human being during our walk, we run into two Spanish walkers at our lunch spot who are also covering the same route that we are on. I feel compelled to ask whether they decided to walk the Kumano Kodo as part of the dual pilgrimage program which covers Kumano Kodo and Camino de Santiago located in their native country – Spain. That is however not the case. 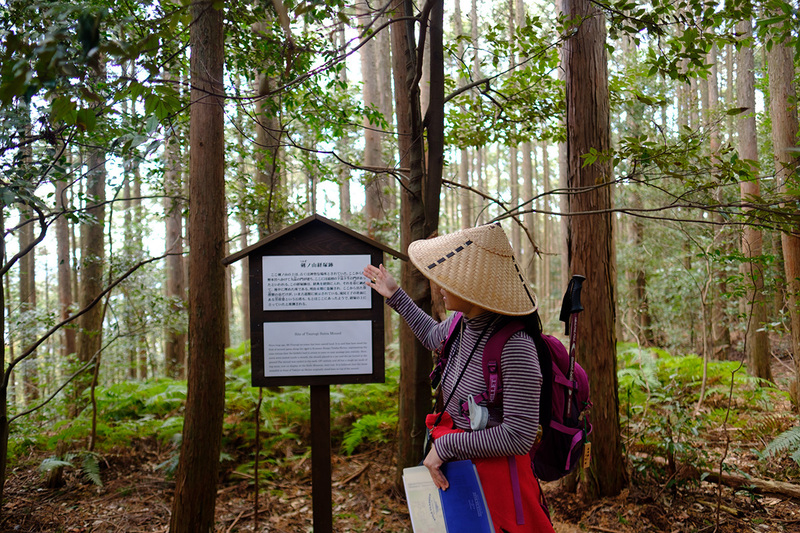 They tell me that they prioritized Kumano Kodo walk, which is much more connected with the nature and feels more secluded compared to Camino de Santiago famous with the yearly amount of walkers that it attracts. They however add that now that they walked Kumano Kodo, they feel it is their duty to also walk Camino de Santiago, also known as the Way of St. James, which is located right in their own country. This is a quite interesting coincidence as it turns out that the Japanese owners of the guesthouse where I spend my second night on Kumano Kodo trail have walked the Camino de Santiago but not Kumano Kodo, even though that is where they live. Guesthouse Mui where we arrive at the end of an hours walk is within a 30 minutes walking distance from the nearest town. I am the only guest tonight in addition to two house owners and their two pet goats who moved to the area from Tokyo about few years ago. It is already 5pm and it is impossible to not notice it in the Japanese villages. A gentle music comes out of the village speakers. Some say that the melody is to remind kids that it is now time to go back home. I will sure miss this gently melody that I got so accustomed to during my stay in Japan, which plays not only at 5pm but also early in the mornings either at 6am or 7am depending on the village you are in (I got 7 am one in Yakushima!). On my last day of the walk, the four hours long trail takes us to one of the most important stops at Kumano Kodo pilgrimage route – Kumano Hongu Taisha. I am today accompanied by Kim Kuribayashi who used to be a school teacher. Kumano Hongu Taisha is not a temple but a shrine. It is pretty easy to get confused about whether you are visiting a temple or a shrine in Kumano Kodo. This is in fact what makes this area so special – reflecting the perfect harmony between Shinto and Buddhism. After days of walking through the forest and small villages, Hongu town feels too busy for me with its population of 4000 people. I am already ready to move up to the land of temples – Koyasan and leave the city life behind.